It’s always fun to celebrate a new mom and their soon-to-be bundle of joy isn’t it? Today a group of bloggers are coming together to shower Lisa from With Style and Grace (surprise!!) with lots of love and well wishes. And of course lots of goodies too. I met Lisa through Maria 2 summers ago at Evo in Park City and was happy to get to know her better on a hike we all took together one morning. If you’ve met Lisa in person, then you know that her smile can brighten up any room and you just can’t help but feel good when you are around her. I love people like that. And I just know her baby boy will be so blessed to have her as his happy mama. This past month, I’ve been completely obsessed with this cinnamon apple spice herbal tea from Celestial Seasonings. I drink a hot cup almost every night before bed for “dessert”. I decided to dress it up a bit and serve it iced with some fresh apple slices, a cinnamon stick and a kiss of honey to bring to our little virtual baby shower today. 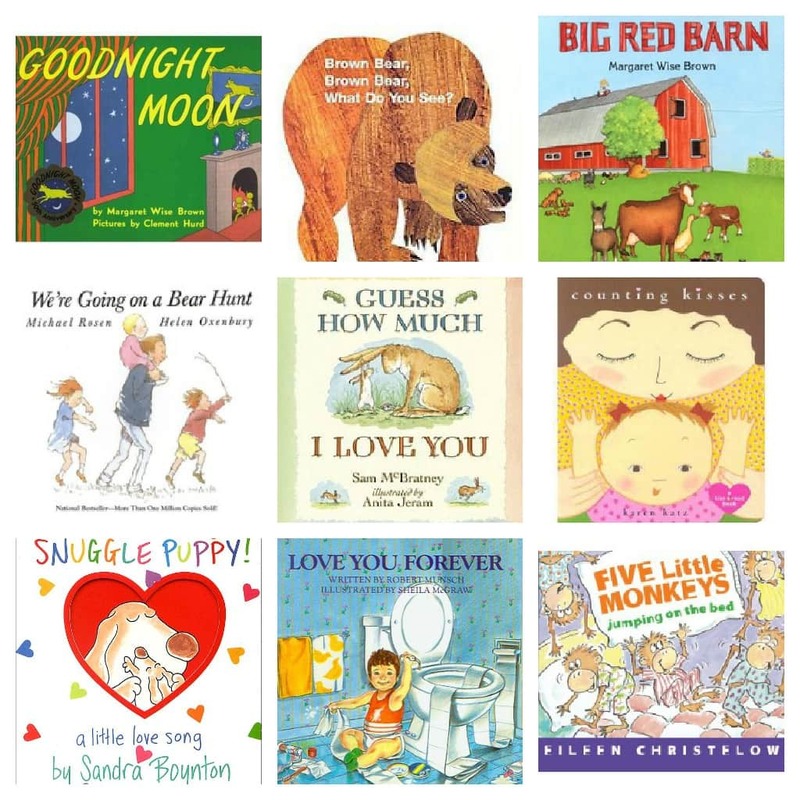 In addition to this lightly sweetened refresher, I wanted to also share with you my favorite baby shower gift that I give to all my new mommy friends – a baby library. I can not walk through a book store or library without spending a good amount of time in the children’s book section so you have no idea how much joy gifting books to a baby and his mommy brings me! All of these books were given to me when my babies were little and we have enjoyed them so much over the years – I can’t even begin to tell you how many times we’ve read each of them. Bring 2 cups water to a boil. Place 4 tea bags in a heat safe pitcher and pour boiling water over tea bags and cinnamon stick. Steep 4-6 minutes. While tea is steeping, add 2 tablespoons honey and stir until dissolved. Remove tea bags and add cold water to pitcher. Chill for at least 1 hour and serve over ice with sliced apple rounds as garnish. Congrats to the Mom to be! I adore these virtual showers. The drink sounds divine (lets call it a Southern Fall drink ;)). I have a few of those books, but will have to get the rest for Kay! I want the monkey book! Yaaay, love this TEA. And Lisa, totes of course. GREAT book suggestions! Love the tea too! I love all the books that you recommended! You’re tying it all together with a classy drink for the shower. I love it! I wish we could all be together. I’m so happy for Lisa and her family! What a good idea with all those books! Every single one of them is a favorite in our house. Welllll done. I don’t think this could be any sweeter! Love. I love all of those books and sweet Lisa! That is a great selection of books – I think we have read almost all of them countless times! What a great iced tea recipe! Cute books too, perfect a new mommy! I Love Your Forever is my #1 favorite, I still cry when I read it. This tea is perfect – festive and seasonal! It seems so long ago but my favorite reads to my kids were Goodnight Moon and Guess How Much I Love You. What a fun event and congrats to Lisa! Yay! The iced apple cinnamon tea sound awesome. Especially since it’s been super warm here in San Francisco. 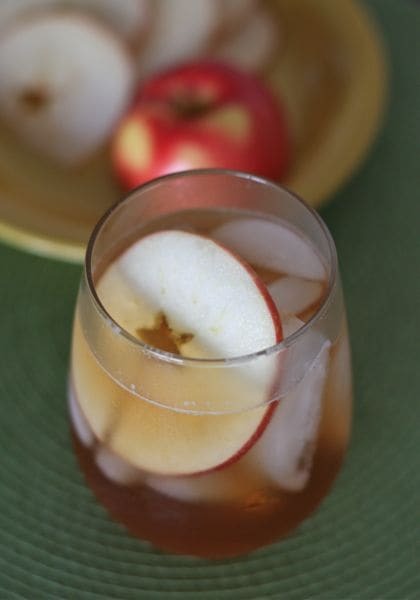 Iced apple cinnamon tea sounds perfect, cold and refreshing, but autumnal. And I love the book suggestions that you made! All classics. This look lovely! So simple and perfect for Fall! Love the tea … and every book I would recommend is there 🙂 Great choices! Several years ago I visited Celestial Seasonings in Boulder and got to sit in the livingroom as pictured on the box of Sleepy Time Tea. Words can’t describe my excitement level. Such great tea!! The colors are so vibrant – your photography is fantastic! 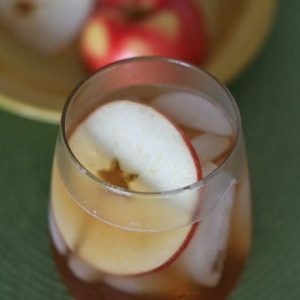 I finally got to make this iced apple cinnamon tea this past weekend and it was such a hit!! Can i post it on my blog? Oh my! 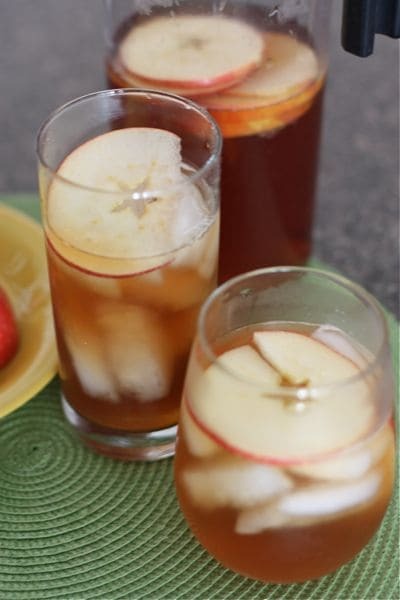 This iced apple cinnamon tea with honey was yummy – and so easy to make! Thanks so much! Wow! This looks amazing! I would try making that iced apple cinnamon tea with honey​ for sure! Can I post it on my blog?